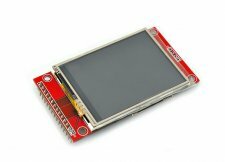 TFT LCD module has always been one of the hot products in DIY industry and LCD is basically the necessary products during all projects, at the same time, serial port modules are also the popular ones, because it takes few IO and the usage is simple. This section of the 2.4S-inch TFT LCD serial SPI integrated features of compact, SPI interface. The LCD drive ic is ILI9341. It's a 240 * 320 (resolution), 2.4 inch TFT LCD screen.The LCD has a wide viewing angle, the contrast is also very suitable.